샌디에고, 미국의 USA 호스텔스 오션 비치 | 호스텔월드에서 예약하세요. 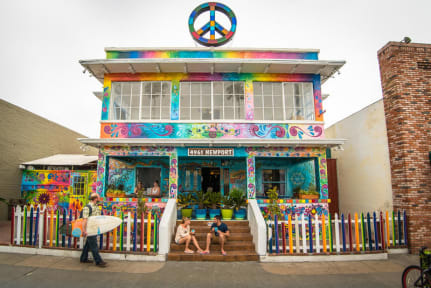 Voted USA's #1 hostel in 2019 by Hostelworld guests, we're just an easy, two-block stroll to the beach. Our completely redesigned hostel provides the most fun, comfortable and convenient beach stay in San Diego. Our free shuttle to major tourist spots in San Diego puts you just minutes from all the city has to offer..or just spend your days at the beach and nights hanging out with us. Pack your swimsuit and sunscreen and we’ll provide the rest! We loan out beach chairs, umbrellas and towels and rent surfboards and body boards. We'll even point you to the right place to take a surf lesson. We require all guests to be 18 or over to stay at our hostel. Please contact us directly for rules and regulations before booking with anyone under the age of 18. USA Hostels Ocean Beach welcomes travelers from outside of San Diego County. At check in, international guests must present a valid passport. US residents must present valid government issued identification (ie: drivers license, state id card, passport). Guests may also be able to present proof of onward travel. 바다가 아주 가까이 있고 시설도 깔끔해요! 다운타운에서 좀 멀기는 한데 저는 바다보려구 여기서 몇일 묵었어요.호스텔 자체에서 하는 활동도 많구 조식도 좋았어요 :) 개인용 콘센트랑 전등도 있어서 편했어요. 추천합니다! 굉장히 청결했고, 친절한 스태프, 바다 가까이에 위치한다는 지리적인 장점 덕분에 만족스러운 여행을 할 수 있었다. OMG 굉장히 좋았던 호스텔이다 연장해서 묵고싶을정도로 좋았다. 먼저 체크인이 굉장히 빠르고 직원들이 모두 친절하다. 아침에 베이글을 먹을 수 있는데 사람이 많아서 빵가루가 이리저리 날아다닐때마다 직원이 와서 제때 정리해준다. 시설이 굉장히 깔끔하지만 가끔 샤워실이 지저분할때가 있었다. 침대는 약간 딱딱했지만 불편하지는 않았다. 한가지 아쉬웠던점은 내 방에 (17) 에어컨이 내 침대로만 직빵으로 오는데 왜 바람이 나오냐고 에어컨을 안끄냐고 아무리 물어도 자기들은 모른다고 대답해서 이불을 하나 더 받아서 배리어 치고 잤다.. 굉장히 춥게잤다. 17번 문 옆 1층침대는 사용을 자제하기를 바란다. 그 이외에는 위치 직원 빌려주는 물품 등 모두 좋았다. 바다와 가까워서 너무좋아요 여기온대부분의 사람들이 서핑이나 바다를즐기러 온사람들이라 그런지 여유있고 흥이넘쳐요 ! 밤늦게까지 노래도부르고 이야기도하고 저는 2층15번에머물렀는데 그곳이 바깥 주방과 앉아서이야기하는 식탁과 가까워서 계속 소리가들리긴했지만 창문내리고 그럼 그렇게 크게들리진않아요 :) 바닷가근처라 바닥에 모래도있고 하지만 더럽다고느껴지진않구요 ! 전 바다보러오신분들이라면 추천합니당 :) 무엇보다 매일 프로그램에 따라 셔틀도운영하고 멕시코 라호야 다운타운 씨월드 공항등 셔틀운영이 아주유용했어요! I thought it was great part that there were lots of ethnic restaurants and CVS near the hostel. It was quite far from downtown so if you were not big fan of beach or surfing it would be better to stay USA Hostel in downtown. 침대에서 소리가 너무 나서 움직이거나 잘 때 신경쓰였어요. 그리고 딱히 캐리어를 넣는 공간이 없고 침대 밑에 놓는거라 불안한 점도 있었고요. 위치는 시내랑은 가깝지 않았지만 셔틀이 있어서 셔틀 이용하면 나쁘지 않았습니다. 공항갈 때도 셔틀있어서 편했어요! 서핑이랑 해변 용품 빌려주는 점은 좋았지만 바다를 안 갔기 때문에..하지만 직원들은 모두 친절해서 그 점은 좋았어요! 음...제가 잤던 곳은 6명이 사용하는 남녀공용 이였는데요. 솔직하게 말하면 처음 들어가자마자 퀘퀘한 냄새 때문에 놀랐어요. 침대 회전 하는걸 보니까 침대시트랑 배겟보만 갈아 버리고 매트랑 배개는 그대로 두더라고요..이게 도댜체 얼마만에 한 번씩 청소하는지도 모르겠고...그리고 첫날은 어쩔 수 없이 이층 침대에서 잤는데 허리가 너무 아파서 세 번은 깬 것 같아요. 전체적으로 그렇게 나쁘지는 않았지만 그렇게 좋았던 것도 아닌 것 같아요.